If you thought brunch was big in the States, it’s even bigger down under. Sertorio is spot-on: a good brunch is simple with a twist of fun, and that’s why it’s such a beloved meal. The Collins Quarter’s brunch is simply good food. 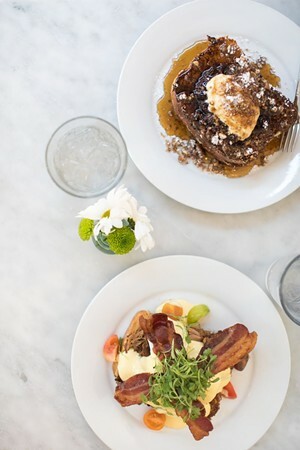 The brunch menu has food served only before or after 11 a.m. and all day long, creating a sense of urgency to try certain dishes. The Upstream Supreme Toast is a favorite, a cheesy toast with salmon and capers piled high. Another bestseller is the Swine Time Beni, a twist on French toast adding pulled pork and a poached egg. Even the cocktails come with a twist—the Bondi Beach Mimosa uses passionfruit and strawberry juice instead of the classic OJ. But as the Collins Quarter knows, the best brunches aren’t just about the food, they’re about the experience.